Take no prisoners... Afghanistan has ordered its soldiers and police not to take Taliban prisoners – but to kill them outright instead. Why? Because captured Taliban are finding it relatively easy to bribe their way out of prison. That means the only way to stop a Taliban operative is to kill him. Most Americans have no experience with the kind of pervasive corruption one finds in many other societies, and are constantly surprised (and appalled) at the effects of it. Afghanistan is one of those countries, and reportedly one of the worst – but it is certainly not the only one. I was once responsible for business subsidiaries in Russia, where we routinely paid bribes (for things as mundane as getting an Internet connection) and protection money (it would be a shame if something happened to your nice, modern office). Locals quickly figured out that American money was being poured into our office in St. Petersburg, and it was obvious that people were angling for every possible means to take a chunk of that for themselves. Not by the means Americans would generally expect, either. One example will give you a flavor for it. Our staff there asked us if we would spring for a bottled water delivery service, so our engineering staff could stop drinking the municipal water – which smelled like gasoline and tasted worse. We said “Of course!”, since we didn't really want to lose staff members to poisoning. The first day's delivery consisted of 20 liter (~5 gallon) bottles filled with distinctly cloudy water. When our staff complained to the water delivery guy, he said: “Oh, you want the clean water! That will be 30 rubles (about $1) extra per bottle, cash only.” This enterprising fellow had found a way to bribe us for our water! Complaining to his boss didn't help, because of course his boss got a cut of it. 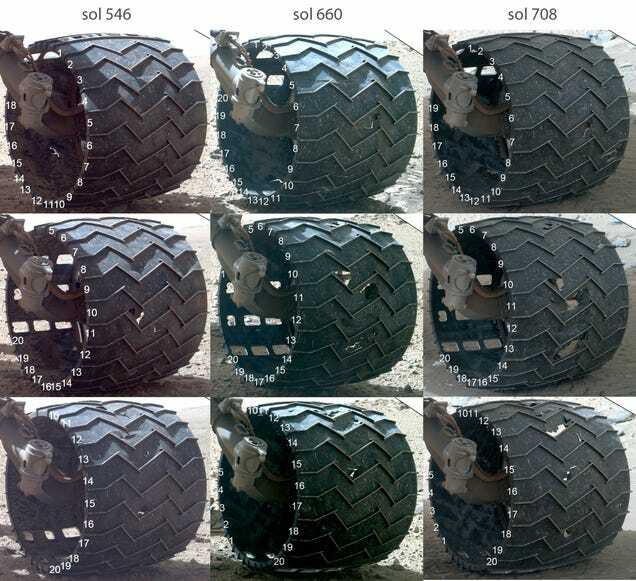 Worried about Curiosity's wheel wear issues? Who needs that damned Constitution, anyway? Who needs that damned Constitution, anyway? Certainly not King President Obama! Barn: pier footing forms... Our builder finished these yesterday afternoon, but the field was too wet and mucky for a concrete truck to get in. We're hoping they can pour today.